This what you should avoid, items still in the wrapper that you have never used. Don’t buy the assembled bags that are sold by many different companies, build your own and you will know what is in it. Bugout bags are a very personal item and what is good for one will not work for the next. Each one of us needs to build a bag in which we are familiar with the contents and know how to use everything in it. Some of us can get by with very little, others require more. The following is a list of items that you may want to consider putting in your bugout bag. The contents of your bugout bag will vary depending on your physical condition, age and size of your family and the weather conditions in the area in which you live. In addition, finances will play a part in determining what goes into your bag. A list of suggested items for your bugout bag. Three days’ supply of food minimum, ( I carry more) to be determined by size and age of family and personal needs. Canned food – meats, tuna, sardine, fruits, vegetables chili etc. I avoid these as to heavy. Hard candy dried fruit, etc. U.S. stainless steel canteen cup can be used for drinking or cooking. One Qt. Nylon canteen cover. Aquamira or Katadyn water treatment tablets 50 per bottle, 4 year shelf life or a good quality water filter like the one made by Sawyer, Platypus, Katadyn or First Need. I like the Sawyer Mini Water Filtration System which only weights 2 oz and if used correctly will filter up to a hundred thousand gallons of water. The cost is only about $25.00. 100% wool blanket is the best second choice for warmth. Check the military surplus outlets. A good poncho, it can also be used to keep you dry in the rain or to make a temporary shelter. BlastMatch, Strike Force and a Sparkie are all commercial manufactured fire starters that will work after having been wet. I carry one of these in addition to matches. A small container of cotton balls impregnated with Vaseline. This will depend on the area in which you reside, and the time of the year. Be sure and pack warm clothes, if you have to stay outside all night it can get cold even when it seems hot during the day. The above list is by no means complete there are many other options depending on your skills. I have not made any suggestions on the subject of self-defense, there are many other good articles on this that I am not going to try and duplicate. My only cautions would be to advise you to obey the law. The important thing is to get started on your bugout bag, even if you just use items you already have at home. Remember an 80% bag on time is better than a 100% bag too late. 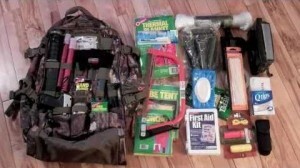 This entry was posted in bugging out, Seventy-two hour kits and tagged bugout bag. Bookmark the permalink. Life is so precious and it is very important to create a complete Bugout bag to survive in critical conditions. I think that the suggestions you have given in your blog are helpful. Can you suggest me a list of items I should add to my Bugout bag while going to survive the wilderness conditions. Check the category, (lower right hand side), 72 hour kits and you will find numerous articles on what to put in a bugout bag.